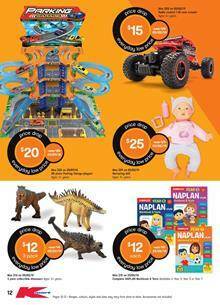 Keep your shopping session safe from the expensive prices with browsing the toys on Kmart Catalogue clearance sale. Kmart Catalogue has a great place in it for the toys and kids' entertainment products. RC vehicles, workbook tests, toy smartphone, wooden toys and more are promoted toys on pg 12-13. Kmart has also a place for LEGO sets. Some of the Kmart stores are always open so you can always shop these prices until 27 Feb. Check out their official page for the opening and closing times of the other stores. LEGO City, Creator sets are on the final page of this catalogue. Visit page 16 for these beautiful sets. The advantage of the Kmart Catalogue price drops that is valid in February is the toy sale currently. See every toy on pg 12-13. You can easily spot them and the price drops on them. LEGO Sets on the last page will cost $9 only. To see more of the every day low prices, track the future Kmart Catalogues and get notifications about the deals, you can always follow our Facebook page.